I have adored actress Gigi Perreau ever since I saw her remarkable performance in a bit part for Enchantment (1948). She played an orphaned girl (who would incidentally grow up to be Teresa Wright) and her ability to project heartbreak, courage and charm with just a few words both touched and impressed me. For this reason I was excited to see her play a prominent role in the thriller Shadow on the Wall (1949), as a troubled child who has witnessed a murder. The film, now available on DVD from Warner Archive also features Ann Sothern, Zachary Scott and Nancy Davis. Perreau is Susan Starrling, a young girl who lives in a luxurious New York apartment with her father David (Scott) and stepmother Celia (Kristine Miller). When Susan happily greets him as he returns from a business trip, he presents her with a Native American doll, which she names cupid because he holds a bow and arrow. Their mutual adoration is clear: David gives an entertaining shaving lesson to his daughter and a friend when she tells him his father has died in the war and he has no one to teach him, and at night he sends the Nanny home so they can have a playful chat while he finishes up her bath. Susan doesn't feel any love for Celia though, probably because she sees through her. Her kittenish stepmother has been seeing her sister Dell's (Sothern) fiancée on the sly. It doesn't take David long to catch on to the affair as well. He exposes the lovers when the four of them spend an evening together. That night David and Celia argue, the latter striking her husband with a hand mirror and knocking him out. He has been holding a gun, though not with intent to shoot, and yet when he comes to his wife is dead, shot in the stomach. In an interesting twist, the audience always knows who the killer is. Dell returns to argue with her sister right after the quarrel and it is she who grabs the gun and shoots while David is collapsed on the bed. What she doesn't know is that Susan has witnessed the crime. David is arrested, and because he can't remember what happened, even he assumes that he is a killer. Though sick with guilt, and on the verge of confessing, Dell lacks the courage to come forward and her brother-in-law is put in jail to wait for execution. Susan lives in a state of blank-faced shock, unable to remember what she has seen. The girl becomes the temporary ward of Dr. Caroline Cranford (Nancy Reagan) as she uses play therapy to try to help the girl through her pain. She is alarmed by the results of the sessions, which seem to indicate that David was not the murderer. As Cranford struggles to help Susan regain her memory, Dell tries desperately to impede her progress, even attempting to kill her young niece. 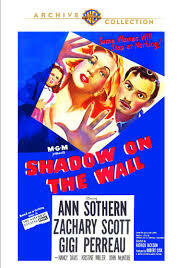 While the themes of adultery, revenge, false accusation and child endangerment are all familiar in thrillers and film noir, they all add up to something unusually intriguing in Shadow on the Wall. There are the little things: like a lightning fast cameo by Barbara Billingsly in her pre-Leave it to Beaver days as a maid, and the interesting glimpses into the medical profession of the day, including an old version of CPR that looks simply bizarre today. There's also an atmospheric, but not intrusive score by Andre Previn, and impeccable production design and costumes. And then there's the leads, the often sunny Sothern as a villain, the typically dastardly Scott as an upright guy; it's fun to see these two break out of typecasting together, and they do it well, the contrasts working with the way they are incorrectly perceived by the other characters. Though I've never been able to stand Nancy Davis as an actress, a distaste I still don't fully understand, I thought she was delightful as the sympathetic doctor: intelligent, warm and believable. Above all else there is Perreau, in a role tailor-made for her talents. She plays an almost unbelievably sweet child, but one who is observant and well aware of the darkness possible in people before she witnesses Dell's crime. Maybe she's sweet, but not sugar sweet; she's got an edge. Young Gigi captures all these elements in her performance. She's always good, but the actress really comes to life when she suffers. At the age of nine she could portray grief, fear and sadness with a sensitivity far beyond her years. For a long time I couldn't understand why this fascinating actress was not a bigger star. Perreau had a decent career in film and television, gracefully making the transition to teenage roles, though not in top notch productions. The actress didn't progress to adult roles though, and would eventually leave it all behind become a stage director and drama teacher. So why such a minor career for a solid talent? I think it is because she was almost too good at suffering. She did it a lot on screen. Audiences may have sympathized with Perreau, but it can be painful to watch her. She's cute, but not in a perky way, because she never lets you forget how vulnerable children can be. You love her, but you can't bear to see her in constant turmoil. Susan is the ideal role for Perreau, because that vulnerability increases the tension beyond familiar thrills. When Dell begins to circle the only obstacle to her freedom, it's terrifying. You don't want this charming, tender-hearted child to suffer anymore. When the toys she has played with in early scenes, her dollhouse and the doll from David, become instruments of fear as they remind her of the crime she has witnessed, you want desperately for her innocence to be returned. 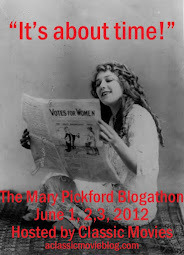 It's a sharp flick. The instructional 1940s take on psychiatry, which was all the rage in films at the time, can get tiresome. It's also hard to believe that a character as sweet as Sothern's could suddenly be so willing to kill a child, but for the most part it's a tightly-plotted film, with great performances and lots of style. A great review! I loved this movie when I saw it a few years ago and hope to review it before long. You are spot-on capturing all its intriguing elements including the unexpected roles of Scott and Sothern. And talk about an interesting look at 1940s medicine, what's with leaving a child alone with a bathtub like the one at the hospital?! LOL. I hope more people will catch this one, it deserves it. Would love to get your take on this one. I always wonder if there is anyone who loves Gig Perreau as much as I do! Scott is also a favorite. He looks like a bad guy, but there's always something so lovable about him to me.Can't believe I didn't mention the bathtub. I was like--she's leaving her there all night? Aside from the drowning, won't she turn into a prune? I agree, there's something about Scott I find appealing, even if I feel a bit guilty about it when he's a bad guy LOL. I really love him when he's a good guy -- just reviewed him tonight in FLAXY MARTIN, where he's a mob lawyer on the run. Incidentally I think you were spot on about how good Nancy Davis is in this. I've only seen her onscreen in a couple films (EAST SIDE, WEST SIDE was another) but she was just right as the doctor. Great to see Sothern and Scott play against type. I also liked Nancy Davies in Donovon's Brain. And she was very effective in her few scenes in East Side West Side. I'll have to check out Donovon's Brain Vienna, I'm thinking that maybe I haven't been very fair to Ms. Nancy! I forgot that she was in East Side West Side. There were so many random stars in that one.